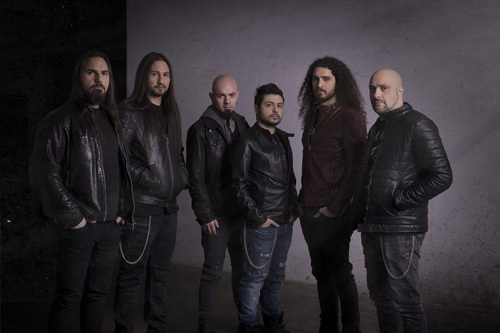 Italy is practically mother of epic symphonic power metal in the European theater. One of its most consistent and prolific producers of the genre has been Rome's Kaledon. And you thought I was going to say, Rhapsody Of Fire. Same lake, just a different boat. 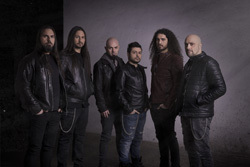 Founded by lead guitarist Alex Mele, Kaledon's albums revolve around the telling of his tale of the fictional kingdom of Kaledon in the Legend of the Forgotten Reign series, in six chapters. Of late, Mele and Kaledon have been telling stories of individual characters within the Kaledon mythology. This time it's Carnagus - Emperor Of The Darkness. Though I know of the series, I don't know much of the story or individual characters. I'm guessing this Carnagus fellow, being the Emperor of Darkness, is pivotal evil bad guy in the legend. So it's probably best I speak to the music. Musically speaking, and without being dismissive, Kaledon delivers quintessential European epic and symphonic power metal. To do so, the band works all the proper genre elements together with some creativity and skill. Of course, the foundation of power metal is classic melodic heavy metal. Then Kaledon drops in the swiftness of speed to ramp up to power metal. Additionally, and essential, is twin guitar harmony in the riffage followed by epic and soaring guitar solos. The keyboard layer is notable in a Kaledon song arrangement. The synth layers add both atmosphere and color, the former in orchestration, the latter in solos. Most every song has a generous synth solo to compliment the guitar solos. As for the vocal arrangements, new vocalist Michele Guaitoli (Overtures, ex-Future is Tomorrow) sings clean, melodic, and strong. Often, to compliment both his vocals and the symphonic layer, the larger vocal arrangements are choral in nature. Fundamentally, these elements blend to create the perfect storm of epic and melodic, symphonic and melodic, power metal. It's what Kaledon does best and, if you love the genre, you will not be disappointed with Carnagus - Emperor Of The Darkness. The only disappointment I found was the use of dirty vocals within Telepathic Messages. But, if Carnagus is the creepy evil dude I expect him to be, then certainly if he's sending telepathic messages, they might sound like a growling devil in one's mind. Nevertheless, as I said earlier, if you like the description of Kaledon's epic power metal, you will like this album. Fans of the band will dig it first, and newcomers will be satisfied as well. Recommended. 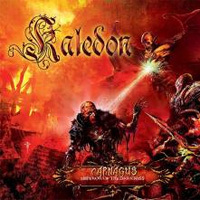 With Carnagus - Emperor Of The Darkness, Italy's Kaledon creates the perfect storm of epic and melodic, symphonic and melodic, power metal Recommended.